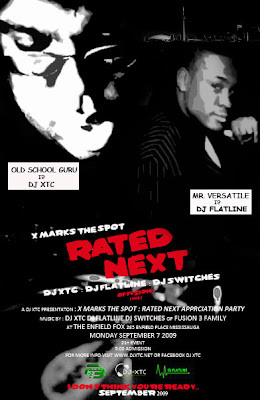 X Marks The Spot "Rated Next"
Over the years we have had several events with a plethora of fantastic djs including Starting From Scratch, Pplus,Jason Chambers,Drk1der,Benn Grim,Kenny Pounall,Uncle Funke,Mod Haus,Carl Allan,Queen Of Spades,and Drill Squad. All of these djs have put there own specific signature on the X Marks The Spot brand. Presenting another in the long line of X Marks The Spot branded events,with a little twist.This party is specifically our way of thanking everyone for making it out and supporting us,it is for the real music lovers.This time we are bringing you the next generation of djs. A couple of djs that need to be on your radar,if the aren't already. DJ Flatline has versatility beyond belief. He truly is a student of djing. Dj Switches from the Fusion 3 Sound crew integrates old school flavour with current club bangers. This combination will promise to breathe fresh air into the regular night out that we have been accustomed to! FULL EFFECT. ONLY LOVE, POSITIVE ENERGY..